Who doesn’t love a pot pie? Make it fun and new with the flavors of your favorite Indian restaurant. This easy meal takes 5 minutes to get ready for the oven and then only 30 minutes to cook. We love to go to India restaurants. And when we do, we always come home with containers of leftovers. One of my favorite things to do with those leftovers is to put them in a pie plate and top them with puff pastry to make a pot pie. 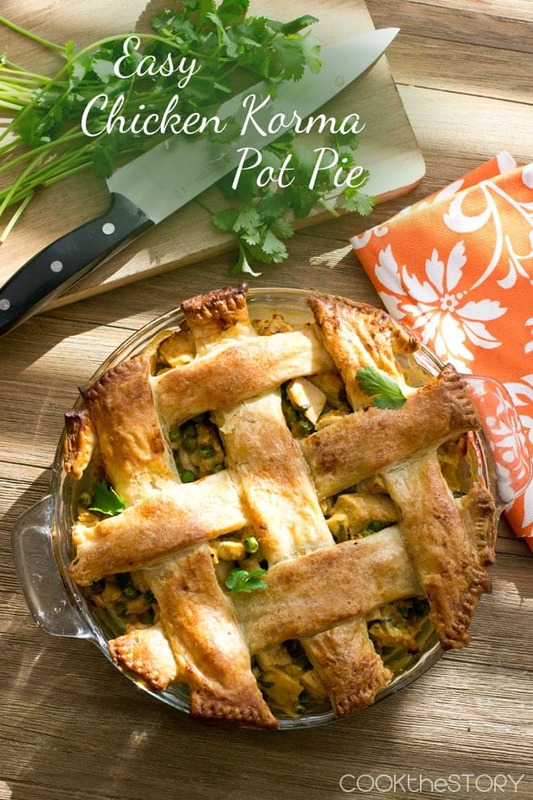 Those Indian pot pies have always been such a hit that I wondered if I could get that delicious flavor without having to go to an Indian restaurant first. I decided to try out the Saffron Road Korma Simmer Sauce. I like this line of sauces because they have unique international flavors but also, they’re very natural with whole ingredients that are all GMO-free, vegetarian, MSG and gluten-free. The single-use pouch that the sauce comes in is environmentally-friendly to ship and is handy to have in the pantry for busy nights. I wondered if I could mix the Korma sauce with some cooked chicken and put it straight into the pie plate with a pastry top. Turns out that I could. 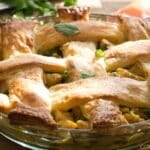 To make this Chicken Korma Pot Pie you just mix together cooked cubed chicken with some peas, cilantro (if you have it), and the Korma Simmer Sauce. Pile it into a pie plate and top it with store-bought puff pastry. From there, you bake it until it’s bubbling and the topping is browned. About 30 minutes. You get a one-pot meal that is full of all the amazing Indian korma flavors of yogurt, coconut milk, ginger and garlic but with only a few minutes of prep time. I know you’re going to love this recipe! I always love recipes that call for cooked chicken because I know that I can use the leftovers from a previous night. But if you don't have leftovers, rotisserie chicken or some quickly poached chicken breasts work perfectly. You need to defrost the puff pastry before making this recipe but not for as long as the package requires. Since you're going to slice it into strips, it's ok if it breaks on its folds as you unfold it. The puff pastry I use is folded into thirds so I break off each third and slice each one into 2 strips. If they're still frozen and hard when you go to make your lattice, that's fine. You can still weave them easily. In a large bowl combine the Saffron Road Simmer Sauce, chicken peas and cilantro. Transfer it to a 9" pie plate. Cut the puff pastry into 6 (1 and 1/2 inch) strips. Lay three parallel equally spaced over the korma mixture. Lay the other three perpendicular and weave them over and under the first three. Bake until the korma mixture is bubbling and the pastry is browned, 30-35 minutes. Disclosure: I was compensated by Saffron Road to develop this recipe and share it on my site and on social media. All opinions are my own. 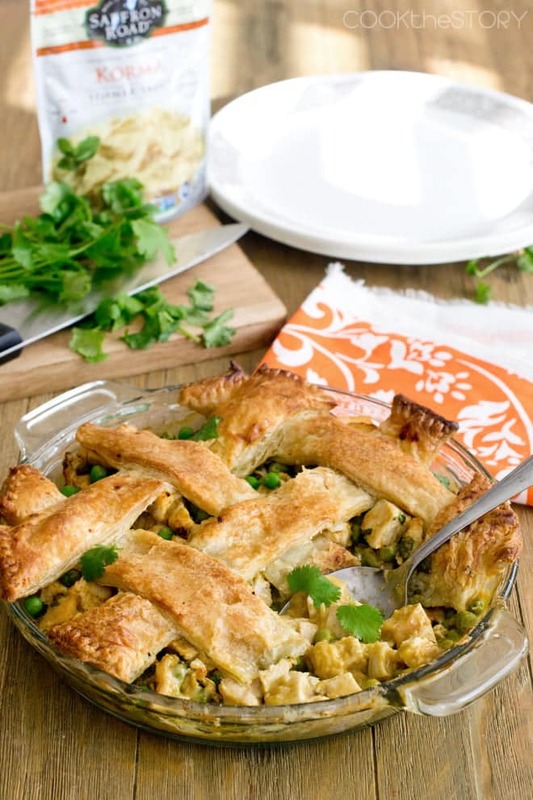 I love curry, but had never thought about putting it in a pie! What a unique idea – it looks lovely! 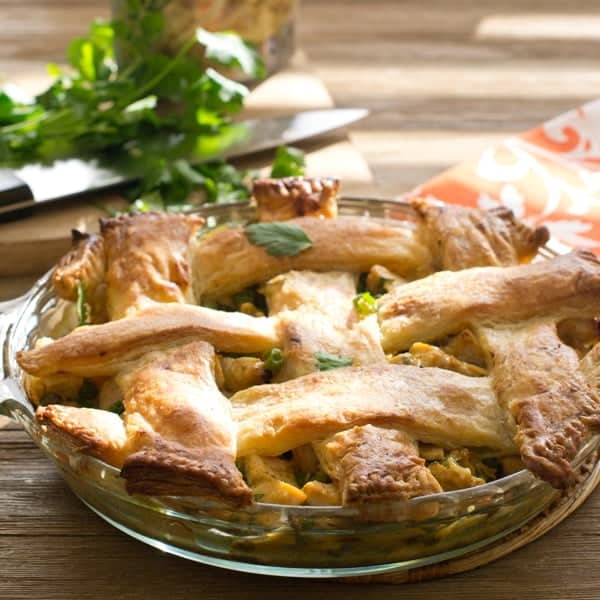 What an innovative fabulous idea for a pot pie. BUT I will have to admit I LOVE Indian food. I have to travel 2 hrs to get to a restaurant serving that. So this recipe rings my chimes! 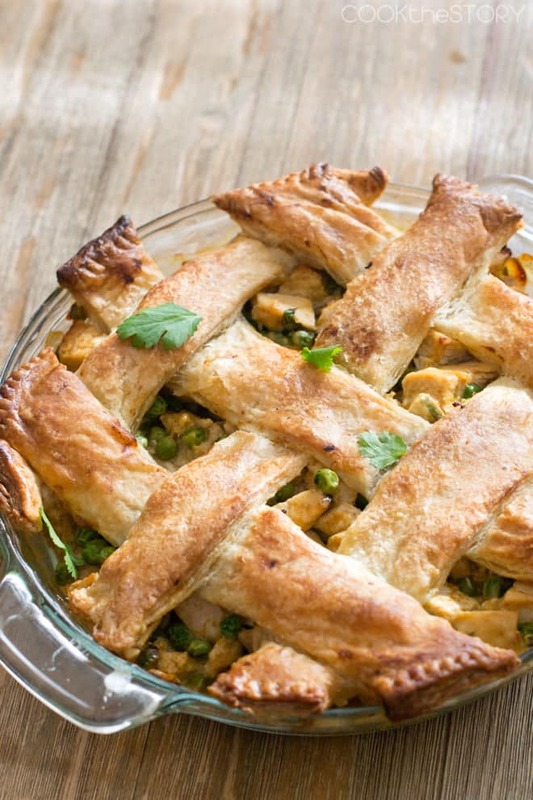 I made a pie very similar to this last year and absolutely loved it! Such a great combination of flavors in one comfy dish!